Jim's Fitness And Sports Blog - Reviews, Routines, Hints, Tips and Much More! Reviews, Routines, Hints, Tips and Much More! British boxing heavyweight, and current world champion, Anthony Joshua will confront Wladimir Klitschko at Wembley Stadium, on April 29th next year with 90000 fans cheering him on. Joshua won Olympic gold in the super heavyweight division, at the London 2012 games, as did Klitschko 16 years previously, in Atlanta, Georgia. 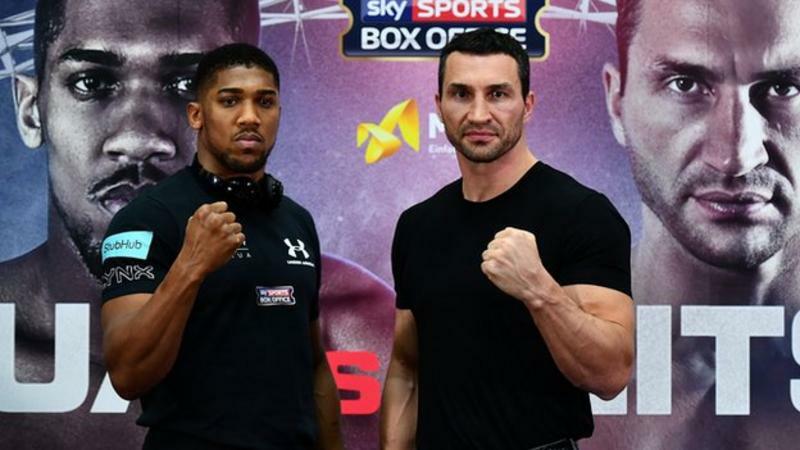 Joshua is the current title holder but many pundits claim he has yet to be tested against proper heavyweights as the division has seen a lull in stars. Klitschko has been out of the ring, in serious contender bouts for 2 years and their age gap obviously making a huge difference. That said though the young British boxer has 18 wins, with 18 knockouts and an average knock out time of less than 3 minutes, or 1 round. Klitschko on the other hand is twice former world champion, with 64 wins from 68 fights. Other than the age and experience gap here, what is interesting about the fight is the 2 boxers are a similar size and with a similar reach. Both fighters are around 6’5’’ and reach 81-82 inches. These are 2 huge guys! Both fighters so far have been fairly respectful of each other with only Klitschko referring to Joshua as his little bro. Something Joshua shrugged off as being ‘irrelevant’. Klitschko had reigned world champion for 9 years until his defeat in November 2015 by Britain’s Tyson Fury. A re-match with Fury has been shelved twice through injury and Fury’s mental health issues. Whatever happens on April 29th, it will be thrilling to see either of these 2 fighters get in the ring with Fury. Britain’s heavyweights are holding their own at the moment. Hi everyone and welcome back to my sports and fitness blog. Did you know that 84% of US citizens don’t hold a gym pass, and 1 in 10 British adults had not walked for longer than 5 minutes in the past 4 week period. 80% of the British population fails to hit the national government target of working out for 30 mins, 12 times a month. One of the many reasons and excuses I hear from people about not getting fit and taking care of their health is because they don’t have the time to go to a gym. Now i’m not going to bore you guys with the many reasons why everyone has time to go to the gym and how we can all fit in the time to take care of our health and fitness. Instead today I’m going to tell you all how to make your home a great place to work out in so that you have no excuses. Setting up your own home gym. Setting up your own home gym is ridiculously simple. You don’t need a massive amount of space or money. Actually as little as 50 pounds is a great starting point to set up your own gym. Check out second hand websites such as www.cheap.forsale/. The first step to setting up your own home gym is to designate an area for workout. Now it doesn’t matter if this area can’t remain a home gym the whole time, just that you have a space. Ideally it should be at least 2 metres by 2 metres, although this should be adjusted based on height. This is for full movement range, and so that you don’t worry whilst working out that you’re going to hit something. Make sure that you have a soft mat, so that you have a soft and comfortable surface for an floor workouts. Everyday items can make great workout equipment. If you’re running low on funds, or have limited space then everyday household objects can easily be turned into exercise and workout equipment. There are many different household objects that you can use, and it really depends on the type of workout that you’re looking for what you will be using. Some great examples include using a crate or sturdy box for a step up, using a football or basketball instead of a medicine ball and using cans or tools instead of basic weights. Depending on the type of workouts you will be doing, or the exercises you are interested in you’ll be wanting to purchase different types of equipment. You’ll also have to be very realistic and take into account the size of the space you have, and your personal finances. If you’re interested in bodybuilding you’ll be purchasing completely different equipment as someone looking to run a marathon. A popular item to buy, especially over the seas with our american neighbours is a treadmill. Now if you have the space and money to buy a treadmill it can have a huge benefit on your workout. I personally have a cheap treadmill I bought online at http://www.cheap.forsale/treadmill. But i wouldn’t quite say it’s one of the most important pieces of equipment you can buy. Instead I’d recommend concentrating on outdoor cardio workouts, for example running outside and spending your money instead on buying more strength, flexibility or balance equipment. Some of the best equipment to buy includes weights, I like to use kettlebells and you can get some great deals online, I bought some here; http://www.cheap.forsale/kettlebells. I’d also recommend medicine balls if you can’t find another ball to use, a sand filled floor mat, which is great for push ups and crunches, and sandbells. Soft equipment is great for at home gyms as they won’t roll away, and won’t damage your house whilst you workout! There are some great resources online for you to use to workout. Look up videos on youtube, and through various other fitness sites. Some gyms also have their own different workout videos where there gym instructors show different fitness workouts. Here’s a useful article with 10 great workout videos. Check it out! Just because you don’t go to a gym full time does not mean that you can’t use a personal trainer. Purchase a one day gym pass and get a personal trainer. Tell them the equipment you have at home, or ask them what they recommend you buy extra and get them to show you a fitness routine that works for you. This is great if you’re new to fitness and aren’t quite confident in your form and techniques. If you get a good personal trainer you can also keep in touch with them and maybe they will do a home visit next time to help train you on your equipment. I hope this has helped anyone interested in setting up their own home gym. If you haven’t please check out one of my latest blog posts about HIIT. Why you should do High Intensity Interval Training. Hi there, welcome back to Jim’s Sports and Fitness blog. Today I wanted to talk about Cardio fitness, and High Intensity Interval Training in particular. On a regular occurrence I will work with people who have been visiting the gym for several months without seeing much progress before they come to me as a Personal Trainer. They will have been focusing on using different weights and machines and building muscle. Obviously I am a huge fan of muscle building, but it’s incredibly important to maintain Cardio exercises alongside muscle building. And my favourite way to do this is by incorporating HIIT into training schedules. High Intensity Interval Training (HIIT) is a technique that can be incorporated into many different workouts. It describes basically any workout which involves short bursts of intense activity followed by periods of less intense activities. You can follow the HIIT technique for most types of workout, for example you can use it for muscle building. However it is more commonly used for Cardio. One of the best benefits about High Intensity Interval Training is that it is highly efficient. A ten minute cardio workout using HIIT can burn more calories than a continual 30 minute workout on a treadmill. Recently the American College of Sports Medicine found that 2 weeks of HIIT workouts can be more productive than 6 – 8 weeks of regular endurance training. Due to the fast speed of HIIT your heart rate should peak at a higher pace, This means that you will also burn more fat and calories for a longer period of time when doing HIIT work outs. These longer periods of fat burning are perfect for anyone who likes to combine Cardio with weight training. Ad even better unlike other conventional forms of Cardio, HIIT won’t encourage muscle loss, instead you lose fat not muscle. Hey everyone, It’s Jim here and welcome to my first blog post on my Sports and Fitness blog. As I mentioned in my welcome blog post, I’m a BodyBuilder and have been into BodyBuilding for the past 10 years. There’s been a lot of progress recently about the best methods to improve in BodyBuilding and I wanted to share some of these with you today. Work out each muscle group several times in one week. Rather than the traditional method of hitting each muscle group on different days, it’s recently been proven that you can gain muscles faster and more efficiently by working out each muscle group 3 or 4 times a week. If like me you work out everyday the best way to do this is to combine Arm and Leg day together, and Back and Chest together. For Ab and core workouts I like to do these daily, as I don’t hit them as hard everyday. Previously It was always suggested that you continue every set until failure, and that the muscle growth zone is between 8-12 reps. What actually works better is to mix up each rep. One time go for a low amount of reps (1-5), next go for the standard amount (6 – 14) and occasionally hit it up for a high amount of reps (15 +) this will challenge your muscles better and mean that you can pack on some serious muscle quicker. We also recommend that you should be able to lift one more time before you quit. Leaving this one rep means that you will still build up muscle without over training and tearing or damaging your muscles. Make sure that you fit Cardio in whenever you can. IT doesn’t matter whether you’re doing Cardio on an empty or full stomach you’ll still burn an equal amount of fat and calories. Hey everyone. My name is Jim, and welcome to UK J Jai, Jim’s Sports and Fitness Blog. I work as a Personal Trainer across several gyms in the Greater London Area. I’m also a bodybuilder and I have won several medals for various competitions I have entered, and came second in the Musclemania competition in 2015, in the Classic Bodybuilding category. I’m a firm believer in you reap what you sow, and that you can’t get to where you want to be in life without putting in the hard work first. I’ve been going to the gym everyday since I was 16, and have only missed days when severely sick, or travelling, I’ve even been known to head to the gym at 6am on Christmas morning. I’m starting this blog so that I will hopefully inspire and encourage more people to head to be active, and do exercise whether that’s at the gym or just going for a run. Just remember ‘Sweat is just your fat crying’, so get out there and let’s make that fat bawl buckets. We can all work out and we can all get fit, we just need to start. Let’s get pumped and just do it. No pain, no gain and all that crap! Hey everyone. My name is Jim ! I work as a Personal Trainer across several gyms in the Greater London Area. I’m also a bodybuilder and I have won several medals for various competitions I have entered, and came second in the Musclemania competition in 2015.